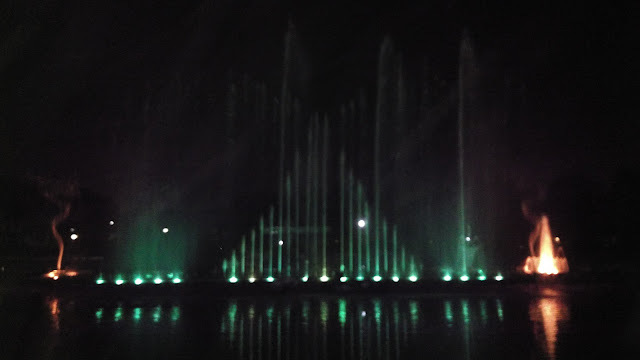 Day 1 - Musical Fountain at Jawahar Circle -- One of the biggest circular park, I think. Jawahar Circle is surrounded by roses, jogging tracks, modern musical equipments and a musical fountain. I was here with a relative who lives in the city. So I was given the inside scoop about how they developed this garden. He mentioned,"JDA (Jaipur Development Authority) has spent about 170 lakhs of rupees for development of this circle". The fountain is located in the center of the park. Every evening at 7:00 pm, the show is held for 30 minutes. The water sprays dance to the music and are illuminated by colored lights that add to a rare experience. A fact worth mentioning - Rajasthan is a dessert state and to maintain such a huge garden and fountain with drinking water is a recklessly bold decision. So the government is using recycled water which is safe for the garden but not for drinking. I will suggest to stay away from the water of the fountain. Day 2 - Amber Fort -- Amber Fort is located in Amer (Jaipur), which used to be the capital of the Kachhwaha clan, till Jaipur was made the official capital. The Amber Fort looks stunning, all built in white marble and red sandstone. To add to this stunning and magnificient beauty, Maotha Lake makes its foreground. 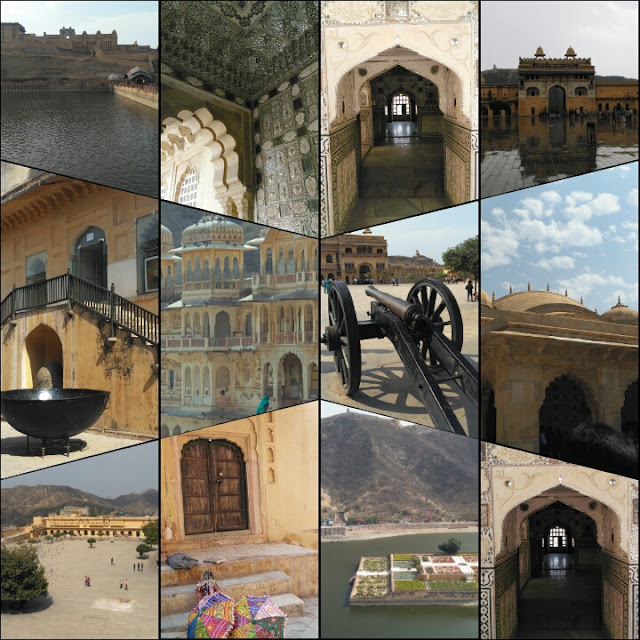 Located on a high hill, Amber fort was built by Raja Man Singh 1. Known for the artistic and blending styles of both Hindu and Rajput elements. Though I did not hire a guide to look around the Fort, however I sneaked into a group of foreign tourists to hear a little information. Man Singh was one of the first war chiefs of Emperor Akbar. Akbar included him in the Navratnas (the 9 gems) of the royal court. The fort has 11 main elements that are worth a stop to look around, know about the history and for photography. I explored much around 6 elements by foot. Though you can hire horses / elephants too. Deewan E Aam and Deewan E Khas - Also known as the "Hall of Public Audience" is a beautiful hall. It stands on two rows of beautiful ornamented pillars and opens on three sides. It is said that the King used to listen to the needs and complaints of General Public. Deewan E Khas, on the other hand, is "Hall of Private Audience." Its a hall with delicate mosiac work in glass all over. At this hall, the King used to meet Ministers and special guests from different states. Sukh Mahal - This is opposite Deewan E Khas and has doors made of sandal wood and ivory. There is a corridor running through the hall which carried cool water that worked as an air conditioner for those times. Kings used to spend their time with their Queens and sometimes with their Mistresses. That is why it is known as the Sukh Mahal, the residence of pleasure. Sheesh Mahal - Also known as the Mirror Palace, is very famous and very beautiful part in Amber Fort. If you remember the song "Pyaar kiya toh darna kya" from the bollywood movie Mughal E Azam, it was shot here. Once you set foot at this place, you will fall in love, like me. The walls and the ceiling of this place is beautifully carved with paintings and flowers all made in glass. Go further and you will discover 1135 AD, a royal fine dining restaurant. Words like Royal, Ornate, Intricate and Regal will flash through your mind when you step in. 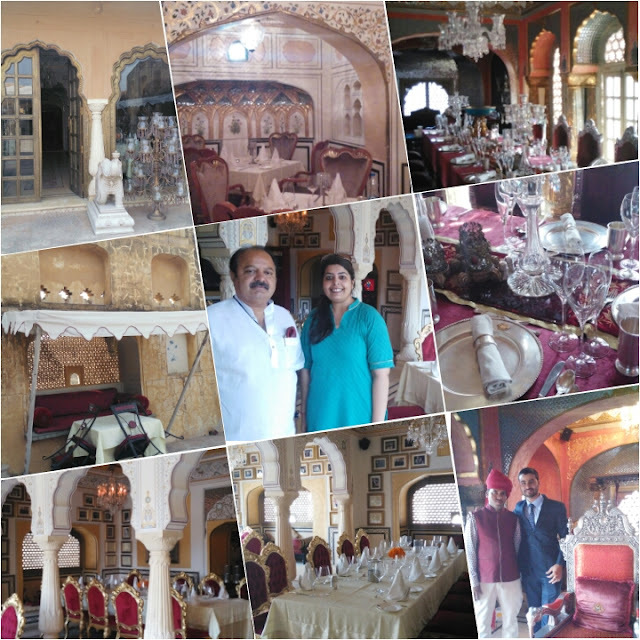 You will feel like a Maharani when you look at the interiors. This restaurant is tucked discreetly behind a fortified section of the fort. Its a bit of a climb but once you get there, you will realise its worth all the effort. For many years there werent too man options available for the visitors visiting the Fort. One would only rely on namkeen shops in and around to pick wafers or soft drinks etc. Today, Amber Fort has come a long way and the government has helped in restoring the true culture for the tourists. 1135 AD looks beautiful and stunning during the evening with attractive lighting and outdoor seating. The restaurant is split in two levels. Keeping in mind the art, culture and tradition of the Palace, food is served on special Silver Thalis. The food is from the tables of the Royal families of the country. It is rich, exotic and fit for the royalty. Naturally then, the food (North Indian & Mughlai) would be superb (I am guessing). It is the star of the show here. Service is efficient and smooth. It is just the place to celebrate a special occasion or share a meal with a special someone. I will give a full detailed post again on 1135 AD on my next visit, when I will be invited to write a review. I could also get a chance to meet the Owner of 1135 AD, Mr Bali, who looks after lots of properties in Jaipur, like the Jodhpur Polo Grounds. Special Thanks to Mr Amresh Singh Chauhan, in-charge of Head Operations, took me around the entire place. On special request he also showed me the Dining Area which only opens during Royal Weddings. The entire room from Furniture to Cutlery is of Silver. I surely felt like a Maharani, sitting at the Coffee Table, having a conversation with him. Govind Dev Ji Temple - The temple represents the royal past of Jaipur and is dedicated to Govind Dev Ji (another name for Lord Krishna). Govind Dev ji Temple of Jaipur is situated in the City Palace complex between Chandra Mahal and Badal Mahal. It is said that the Queen would take Darshan of Govind Devji every day in the morning before she would start her daily chores. Visiting Time: 6:30 am to 12 noon and 3:00 pm to 8:30pm daily. Village -- Adjoining the resort is Choki Dhani Village. 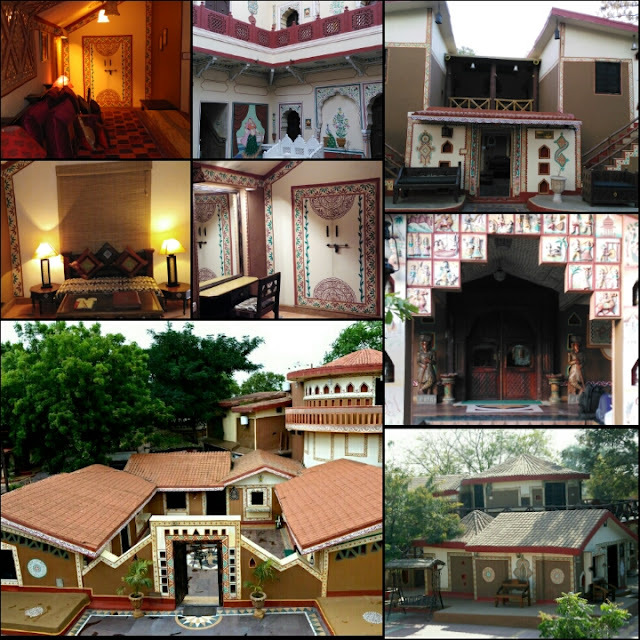 Spread over 100 acres of land, one gets to experience the spirit of Rajasthan here. 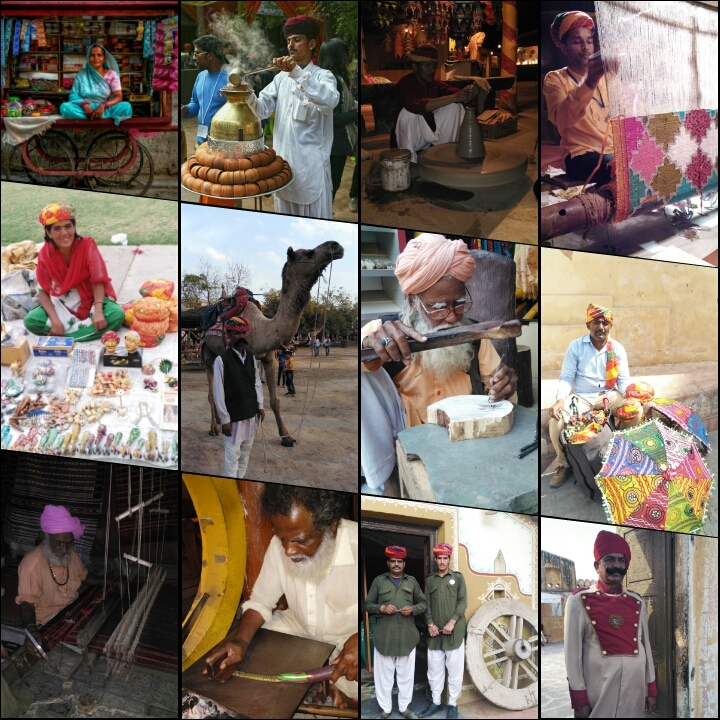 Their main aim is to preserve and encourage young people to know the true Indian Village activities and their art. As soon as you enter, you will be greeted with big smiles, a tilak on your forehead and a refreshing drink. They have the best cooks from royal palaces and different kinds of artisans captivating your attention to the way they make different kinds of products. Though I have seen many artisans in Delhi, however, the artisans here were more hard working and experts. I met an 80 year old man who would sit to carve wood blocks used to make Block Printing. I also met, an artist who makes Pots from his Pottery Wheel, also known as Chaak in Hindi. I sat with him on the ground to learn this fascinating art. Its been long on my mind to learn this art. Given the opportunity, I shall learn it this summer. Picture - Brought back a memory. After capturing the different forms of art, I finally sat Choki Dhani, where they serve authentic Rajasthani Food. One is supposed to sit on the ground with square shaped Chokki's placed in front of you. These Chokki's have a leaf plates and bowls displayed. For water and a drink, they serve it in matti ka glass. The servers are all dressed in Rajasthani costume with Pagdi's. They start with white butter and salad on your plates and gradually Dal Batti Churma, Gatte ki Sabzi, Sarson da Saag etc are served one by one. They do not understand the word NO. For them even a person like me, is not well nutritioned. In their words - beta tumne abhi ghee toh taste he nahin kara, yaha ka". Its love that they shower by the way they serve food. Also I learnt that the food they serve is grown there itself. Its so organic and fresh. City Palace - The impressive city palace is situated right in the center of the old city. Its a complex of courtyards, gardens and buildings. They say the outer wall was built by Jai Singh and gradually built over the centuries. Built on Pichola Lake, the Palace looks so scenic and beautiful. I could have sat there for hours. There are mountains that are visible, the palace and then the Lake. Sounds serene, right? 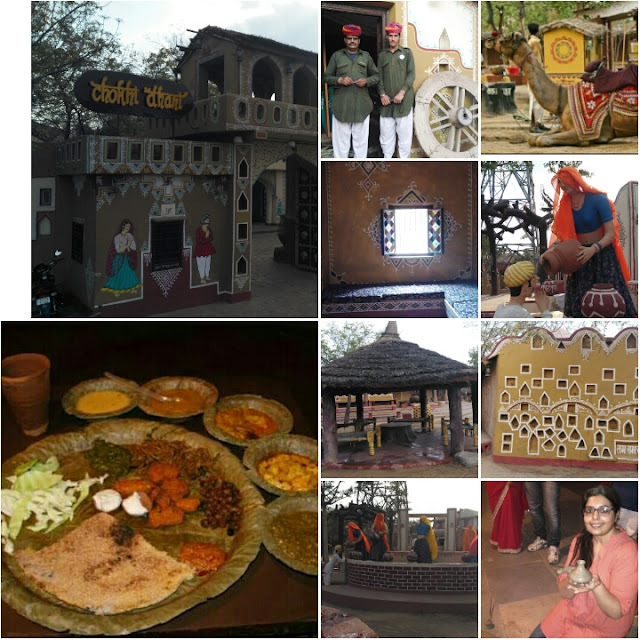 Day 4 - Kanha, Rawat Eating Joints & Shopping -- A day I devoted to just eating and shopping. Though there are many options to eat around the city, however I chose to eat the famous street food. Probably next when I am in the city for a longer time, I will explore dining restaurants. But for this time it was Kanha and Rawat. Chhole Bhature at Kanha - What Haldiram is to Delhi, Kanha is for Jaipur. Located in Bhagar Singh Marg, C Scheme Central. They serve North Indian and Chinese at Rs 400 for two people. Ideal for breakfast, this place serves everything. From Mithai to Chaat, a fix for everyone. The only thing this place lacks is the service - its slow. The Famous Rawat serves Jaipur's onion based Kachori's. 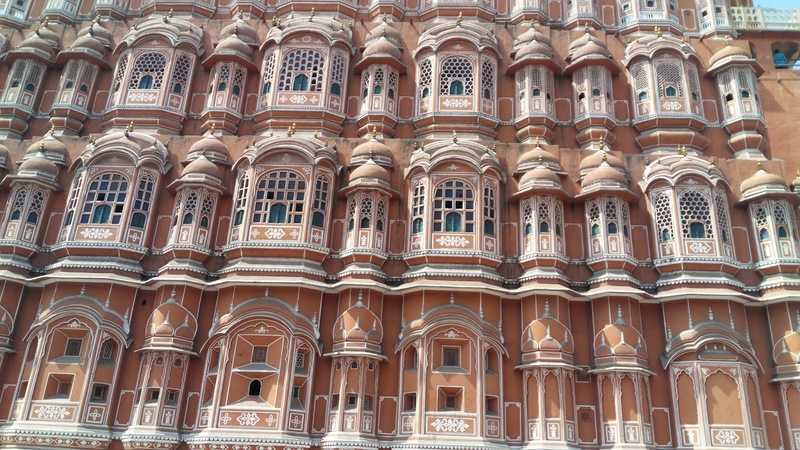 Lastly, what Janpath is to Delhi, Hawa Mahal shopping area is to Jaipur. I was trying to find where one could buy the glasses they have used in the paintings in Amer Fort. With lot of roaming here and there, I failed to find a single shop. Since there is a lot of marble work done in Jaipur, you find statues in marble. Beautifully carved and hand painted. Jaipur is also famous with hand woven Umbrellas. Chai Walla on the streets.